If you are looking for a non-toxic sturdy toy...you are in luck. 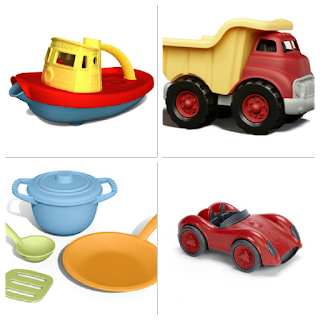 Green Toys offers wonderful vibrant toys that are not only safe for your child but earth friendly. They are made from recycled milk jugs! How cool is that?!? 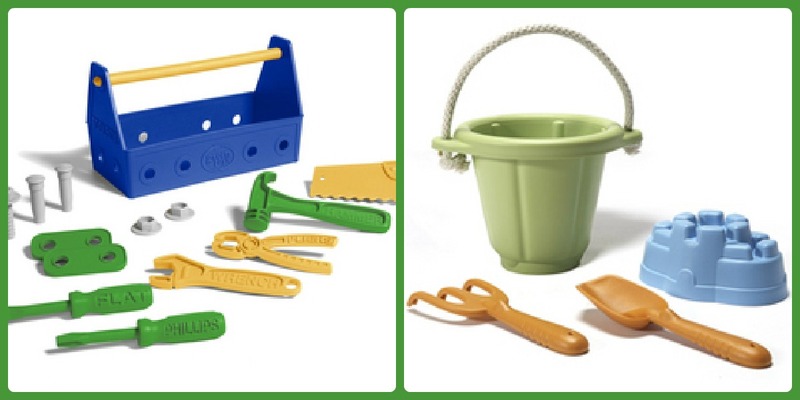 We own several Green Toys products and are excited to add another one to our collect. 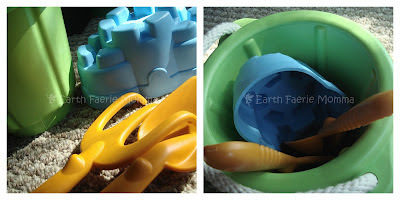 Green Toys sent us the Sand Play Set. It comes with a bucket, a shovel, a rake and a little sand castle mold. 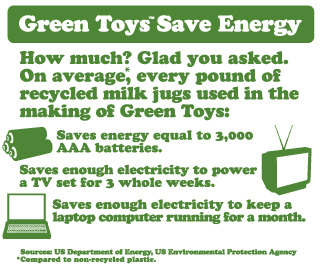 Green Toys are made in California and must pass some pretty strict toy safety and environmental laws. 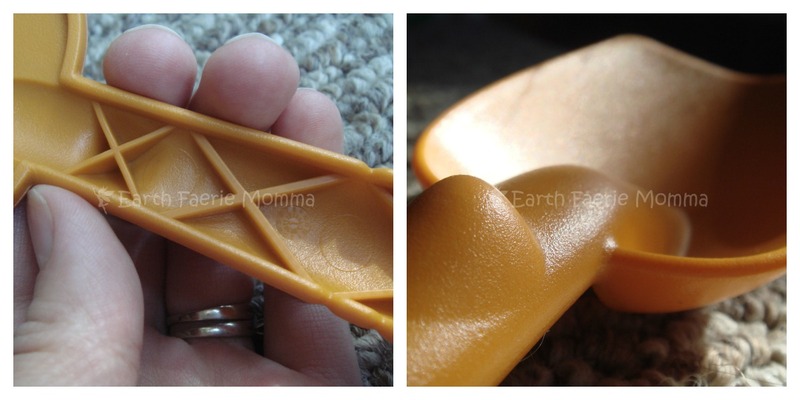 They are made from recycled high-density polyethylene (HDPE), which is recycle symbol #2. Along with polypropylene (PP), HDPE is one of the safest plastics. The bucket has a nice shape for building sandcastles. 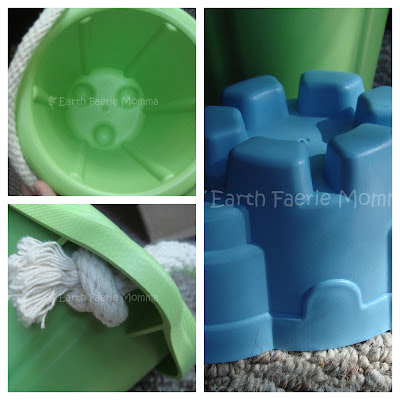 The little blue mold is perfect for adding a finishing touch. The bucket handle is a sturdy braided rope! There is a nice lip on the edge of the bucket making it easy to flip over to make a sandcastle! Here are some action shots of Vallon. Chase was too busy for this photo shoot. The product is for 18 months up. I supervise Vallon with the shovel and bucket. 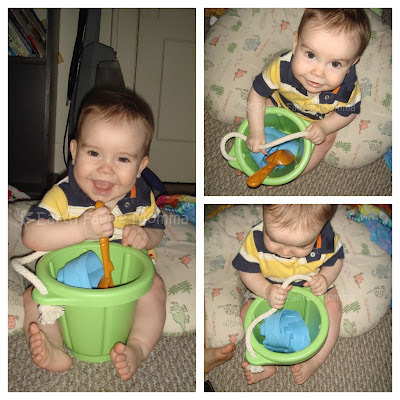 I think he enjoys the bright colors and soft handle. The shovel and rake have a nice sturdy design. I don't think I could break them if I tried. The handle is not solid, though. There is a criss cross design underneath. Everything fits nicely in the bucket. We are ready for a day at the beach now! What do we ♥ about it? These are so sturdy! I can't even bend them. The shovel is perfect for digging in the dirt or sand. Both of my boys enjoy playing with this and it is nice to know that these will last a long time. As I said before we have several other Green Toys products and they hold up so well. I love that they are made from recycled material but they are still safe. You can't beat the packaging either. No plastic ties or bags! The only thing I would change, if I were to be very picky, are the handles on the shovel and rake. I would prefer them solid and round so they are more comfortable to hold. That is just me though. Chase doesn't have any problems with them. 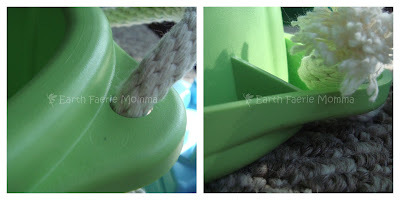 I highly recommend Green Toys products. There are so many great toys to choose from. I'm sure we will continue to add to our collection. 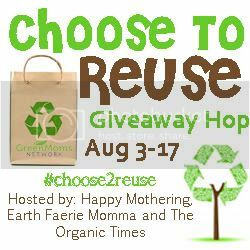 Connect with Green Toys on FACEBOOK, TWITTER and PINTEREST. I Want To Try Eco Nuts!